Georgetown University's School of Continuing Studies (SCS) is adding another degree to its portfolio of professional graduate programs: the Master of Professional Studies in Applied Intelligence. The program, launching in fall of 2017, is designed to meet the growing demand for professionals who can support the critical—and evolving—data functions of today’s organizations. The continuous advancement of technology has created a ripe opportunity for the field of applied intelligence. As functions such as business intelligence, predictive modeling, and data mining become more and more critical for organizations, employers are seeking professionals with a mastery of data skills—those who are able to not only interpret data, but also apply it in meaningful ways. And this trend is far from fleeting. According to the Bureau of Labor Statistics, employment for information security analysts is projected to grow 18 percent from 2014–2024, while employment for operations research analysts is projected to grow 30 percent over the same period—much faster than the average growth rate for all occupations. Georgetown’s program will emphasize the analytical and technical skills that students can immediately put to use in the workplace to improve performance, increase efficiencies, and generate insights. Students can take classes for the 33-credit degree online, on campus, or through a combination of both. Both part-time and full-time options are available. A distinctive feature of the Applied Intelligence program is its focus on both the private and public sectors. While many programs only focus on one or the other, Georgetown’s curriculum exposes students to key concepts across sectors, examining topics from threat assessment and interagency collaboration to competitive strategy and global competitive intelligence. 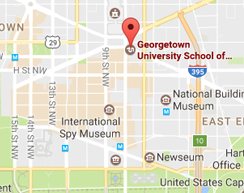 Capitalizing on Georgetown’s broad network and its location in the nation’s capital, the program will provide opportunities for students to engage with industry experts and renowned organizations, government agencies, and private-sector businesses within the intelligence community. The master’s in Applied Intelligence has begun accepting applications for Fall 2017.